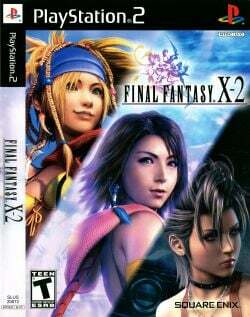 Game description: Final Fantasy X-2 is the first direct sequel of Final Fantasy X. X-2 highlights a cast of returning characters and features mission-based gameplay, an all-female lead cast, unique job classes and a dynamic battle system. The story takes place two years after Yuna defeated Sin in Final Fantasy X, and follows Yuna's journey to find her lost love. Scattered all across the dangerous lands are spheres which show visual recordings of historical events or open up different types of job classes to use in battle. The game's story follows the character Yuna from Final Fantasy X as she seeks to resolve political conflicts in the fictional world of Spira before it leads to war. Description: In Hardware mode during cinematics, there is flickering and black lines all over the screen. Workaround: Go to Config > Emulation Settings > Game Fixes tab, click "Enable manual game fixes" and enable the "Switch to GSdx software rendering when an FMV plays" fix. Or manually switch to Software mode during cinematics by pressing the F9 key. Description: Objects and characters have ghosting effects when they appear against the horizon. Workaround: Go to Config > Video (GS) > Plugin Settings, click "Enable HW Hacks", go to Configure Hacks and set Skipdraw to 1. Description: Some of the ground in front of the Youth League headquarters is invisible, leaving the sea visible underneath. Workaround: There's no known solution. Workaround: Go to Config > Video (GS) > Plugin Settings, then close the window again to reset the plugin and this issue will be temporarily resolved. This page was last edited on 16 April 2019, at 07:45.